Bruce Springsteen has a Halloween treat with no tricks for all his fans. He's posted a free download of a new song, A Night With The Jersey Devil, and a streaming peek at the video on his website. The song is built around a stomping Muddy Waters beat reminiscent of Mannish Boy and features Springsteen raging in a demented, distorted voice about "16 witches casting 16 spells." He plays some pretty mean harmonica too. In all, it's wicked-cool stuff, and proof-positive that The Boss can still bring it like nobody's business. 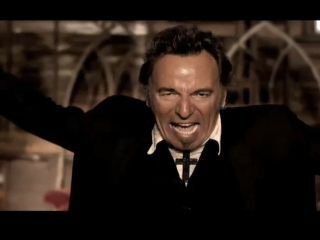 The video, directed by Thom Zimny, is a hell-raiser, with Springsteen portraying the Jersey Devil, a possessed preacher summoning fire and brimstone and the like. Check out the video here and download the track here. We have to say, it's the best thing Bruce has done in years. But if you want to catch it, you have to act fast: both audio and video will be available on the site from 12:01 am Friday, 31 October until 11:59 pm Sunday, 2 November. Unless some ghoul or goblin puts it on YouTube.